Raspberry Pi enthusiasts that have already been able to get their hands on one of the new Raspberry Pi Zero single board pieces and have already started tinkering with it. Maybe interested in a new quick project created by Frederick Vandenbosch who has transformed the Pi Zero onto a powered USB hub. Check out the video below to learn more and see how to create one yourself. The new Raspberry Pi Zero is cheap enough to try more “adventurous” things without worrying too much about things going wrong. Combined with the fact that the new connectors are not very practical, I decided to solder the Pi Zero onto a powered USB hub. It’s really compact, but the adaptors and cables required to hook up USB devices or a display are a bit of a pity. To partially remedy this, and because I happened to notice one of my USB hubs (LogiLink UA0160) had the exact same form factor as the Pi Zero, I combined the two. A fun and low cost little project. First thing I did was to make the connections to power the Pi Zero from the USB hub’s power supply. Removing the hub from its casing was a piece of cake, and it exposed the necessary points to solder to. At the bottom side of the Pi Zero, pads are available. These are ideal for making connections with other components or boards such as the hub. 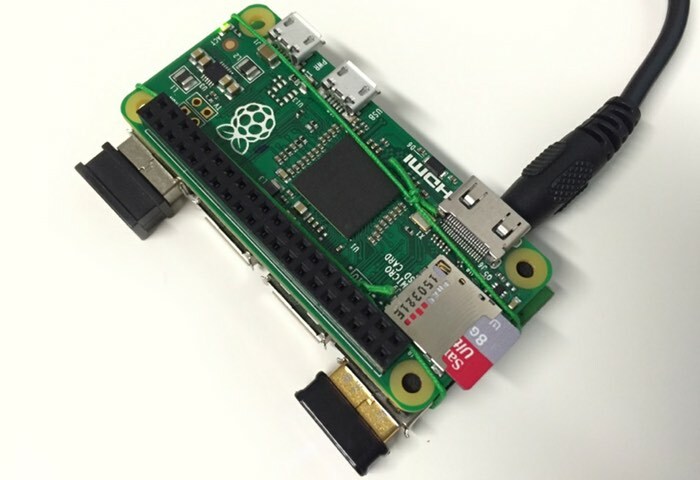 For more information on the project jump over to the Frederick Vandenbosch website via the link below for full instructions on how to create your very own using the new Raspberry Pi Zero. If you found this article interesting you might also be interested in this list of awesome Raspberry Pi Zero projects we have put together.